Caryn Deri is on the speed dial of nearly every hospital and chemotherapy center in South Florida. Deri, 43, of Coral Springs, and her husband, Moti, 48, are the owners of JMC Hairwear and Wig Salon, one of the busiest booths at the Festival Flea Market Mall in Pompano Beach. The shop has a reputation as the place to go for women who are about to start chemotherapy and face the additional trauma of losing their hair. Deri’s knowledge, compassion and dedication go far beyond her paying customers. Each month for nearly 10 years, she has visited North Broward Medical Center to fit and style reconditioned wigs and give makeovers to women who can’t pay. The wigs are donated by Deri’s former customers, who she said gladly troop back to her shop to help other women in need. Her vendors and suppliers contribute products for the hospital clients. Deri and her staff clean, repair and restyle the wigs to await their next wearer. Whether the wig is new or reconditioned, no woman walks out of her shop or the hospital without the proper fit, color and style. Deri estimates she has given out about 8,000 customer-donated wigs, and another 500 wigs plucked from her own inventory when just the right wig wasn’t available to fit the client in need. “Many people do not have insurance or can’t afford a wig,” Deri said. “To me, in any business you are in, you should treat people with respect. The most important thing is for people to feel comfortable, especially when they are going through something like cancer.” Deri and her husband, both hairdressers, failed in their first business venture. “We really lost our shirts,” she said. They used that as a learning experience and opened their salon 15 years ago. 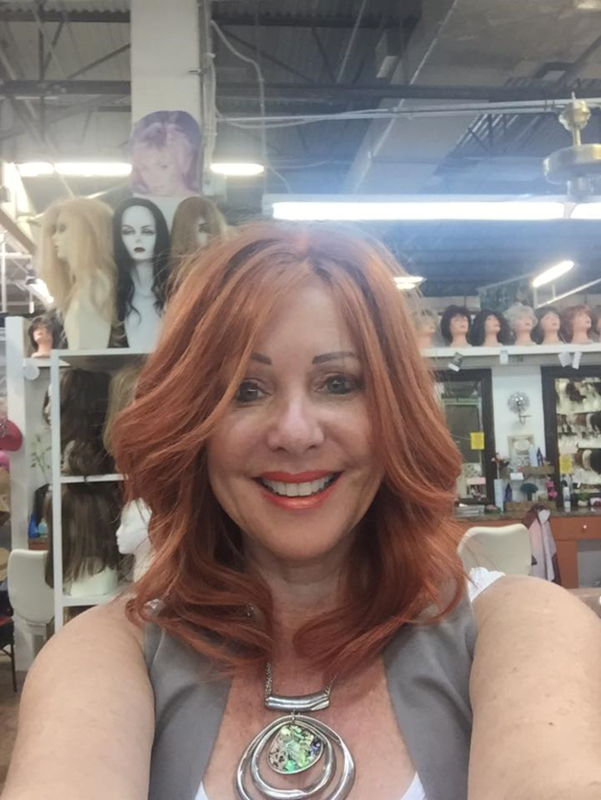 “I thought there was a need for a wig salon, because some of my clients had wigs that needed regular styling. I opened a shop, learned a little about what was needed, and found that a lot more people were wearing wigs than I had anticipated,” she said. Her shop now has a staff of 15. Most of her customers like the variety and convenience of wigs. But in addition to cancer patients, her clientele also includes men and women suffering from autoimmune skin diseases, or they are chronic hair pullers. Deri said she often has to educate her clients about the effects of chemotherapy, especially the process of hair loss. “Doctors and nurses are more concerned about the medical aspects of the treatment, and I find myself telling customers about what they are going to go through physically. I try to be up front with them,” she said. Their most frequent question is “When?” “They want to know at what point should they start wearing a wig. I prefer to see them before their hair starts falling out, so I can make them look like nothing happened,” she said. “I tell them to wait until they have a little tingling sensation in their scalp, and they can pull a handful of hair out, then to call me and we will take care of them.” Clients are taken to a private room where their head is shaved and their new wig fitted. “We make everything fits like a glove before they leave,” she said.